A turn of the century 1894 period cottage located with convenient access to the A11 junction and situated between the market towns of Attleborough and Thetford. 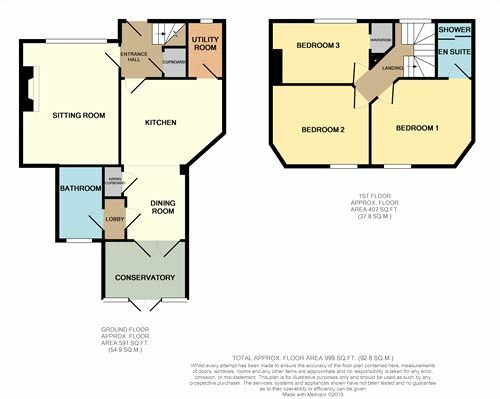 This property is beautifully presented throughout with a contemporary fitted kitchen which is open plan into the dining area and also comes with a stylish bathroom suite which includes a double ended bath. Outside there is off road car parking to the front of the property, the rear garden is neat and laid to lawn with spring flowers providing some stunning views over the adjoining countryside. From Attleborough proceed southbound on the A11 towards Thetford, proceed past the Snetterton junction then exit at the next junction sign posted Watton/East Harling, at the end of the slip road turn right proceed under the A11 bridge and continue to Larling, the property will then be found after a short distance on the right hand side. Double glazed front entrance door, under-stair cupboard, tiled flooring, stairs to first floor. 14' 11" x 11' 10" (4.55m x 3.61m) Feature natural facing red brick fireplace housing wood burning stove with adjacent red brick arched alcove, radiator. 12' 11" x 10' 5" (3.94m x 3.18m) Fitted in a range of matching base units and wall cupboards with solid oak worktops and plinth lighting comprising sink unit with swan neck mixer tap, built-in electric ceramic hob with double electric oven beneath and canopy extractor hood above, integrated dishwasher, recess space for American style fridge freezer, pull out tall larder units, recessed ceiling down-lights, radiator. 10' x 8' - 7' 5" (3.05m x 2.44m - 2.26m) Built-in airing cupboard housing pressurised hot water cylinder, twin opening doors to conservatory. 9' 11" x 7' 1" (3.02m x 2.16m) Twin opening double glazed doors to enclosed rear patio and seating area, radiator, polycarbonate roof. Tiled flooring, door to bathroom. Fitted in a stylish contemporary suite comprising double ended bath with a hand held mixer spray, wash hand basin with pull out drawers beneath, w.c., colosseum and chrome towel rad, fully tiled walls and tiled floor. 6' 10" x 4' 5" (2.08m x 1.35m) Fitted work top with space and plumbing for automatic washing machine and tumble drier beneath, open shelving, tiled flooring. Patterned double glazed leaded light window, access to roof space. 12' 10" x 10' 5" MAX (3.91m x 3.18m) Exposed red brick feature wall housing inset cast iron fireplace, radiator. Comprising wash hand basin with cupboards under, w.c., walk-in shower with sliding splash door and splash screen, extractor fan, fully tiled walls and floor. 12' x 9' MAX (3.66m x 2.74m) Radiator. 12' - 10' 8" x 8' 5" (3.66m - 3.25m x 2.57m) Built-in wardrobe cupboard with hanging rail, radiator. The front of the property is open plan and gravelled providing off road car parking. There is a vehicular side access with a right of way over the adjacent property providing access to a further parking area and the garage. To the immediate rear of the property is an enclosed walled patio seating area with access into the Old Wash House 9' 9" x 8' 11" (2.97m x 2.72m) which incorporates a Belfast Sink, Oil Fired Boiler, radiator, fitted work surface with drawers and cupboards under, wall mounted storage cupboards and an access to roof void. A covered passage leads from the enclosed patio garden through to the concrete hardstanding where the oil storage tank is situated and continues to the rear garden which is laid to lawn with a patio area and various trees and shrubs, the rear garden is enclosed by fencing. Situated to the rear of the property accessed via a right of way over adjacent property with up and over door. Prospective purchasers should check the vehicular right of way over the adjacent property through their legal representative.